The AMOSSHE National Conference 2019 is the UK’s foremost opportunity for Student Services leaders to share expertise and good practice, develop strategy and skills, and build professional networks. Building communities and strengthening collaboration are key themes for the conference, with a focus on evidence-based practice. With so much experience and expertise in one place (over 280 Student Services and sector leaders from 150 higher education providers and sector organisations) the AMOSSHE National Conference is the ideal forum to explore how to develop supportive, productive higher education communities that empower and enable students, and to nurture strong partnerships with peers and colleagues across the sector and beyond. The conference features a broad range of insightful sessions, alongside opportunities for networking and celebrating success. This is your time to think big, reach further, and innovate in our shared mission to enhance the student experience. The conference takes place from Wednesday 3 to Friday 5 July 2019 at the Hilton Birmingham Metropole in Birmingham, UK. Find the conference prices and book your place here: AMOSSHE National Conference 2019 booking. Please note that photographs and footage will be taken throughout the conference. These will be used by AMOSSHE for marketing and publicity in our publications, on our websites, and on social media. Please contact the AMOSSHE team if you have any concerns or if you wish to be exempted from this activity. The AMOSSHE National Conference 2019 takes place in the heart of the UK at the Hilton Birmingham Metropole in Birmingham. Set on a lake beside the National Exhibition Centre (NEC), Genting Arena, Resorts World Complex, and the new Bear Grylls Adventure, the Hilton Birmingham Metropole hotel is close to major rail and air transport links, and features a LivingWell Health Club and pool. If you're a residential delegate, your booking includes accommodation for two nights at the conference venue with all meals, and all evening events. While at the Hilton you can also take advantage of the health facilities and pool. 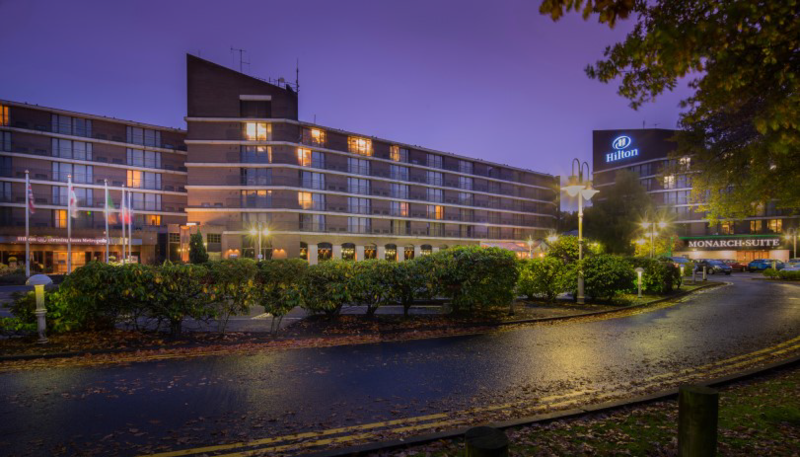 If you want to stay at the Hilton hotel on the nights before or after the conference, find the best prices here: Hilton Birmingham Metropole. If you’ve also booked a residential place, please email Anya at info@amosshe.org.uk with your dates, and we’ll make sure you’re in the same hotel room for your entire stay. If you choose not to book a residential place, AMOSSHE can't arrange accommodation for you. Non-residential day places at the conference include lunch and refreshments at the Hilton only. You can attend the evening events on 3 and 4 July for an extra charge. The conference features sessions led by AMOSSHE members and key organisations in the higher education sector, plus keynote presentations, networking discussions and social events. Find out more about the call for session proposals. The AMOSSHE Annual General Meeting (AGM) is the annual opportunity for AMOSSHE members to engage with the development and direction of their professional association. The AMOSSHE National Conference 2019 opens with a panel debate about building communities and strengthening collaboration in higher education, featuring representatives from university leadership teams, student leaders, and higher education sector experts, including voices from the devolved UK nations. Fleur Priest-Stephens (Policy Consultant) explores the findings from two recent large-scale enquiries into the accommodation students live in during term time: the Accommodation Costs Survey, looking at purpose-built student accommodation, and Homes Fit for Study, looking at the private rented sector. Discover insights from this research, and discuss what might be 'excellent practice' in supporting students from all backgrounds with their accommodation and wellbeing - moving beyond offering advice and guidance to consider structural or physical changes that can implemented to achieve positive change for students and institutions. Roxana Parra Sepulveda (Lead Wellbeing Practitioner, Kingston University) and Alexandra Neal (Psychological Wellbeing Practitioner, iCope Kingston - Camden and Islington NHS Foundation Trust) present the experience of developing and implementing the Student Pathway Project. This initiative is the result of collaboration between Kingston University's Student Wellbeing Service and the local IAPT (Increasing Access to Psychological Therapies) service, iCope Kingston. Learn about the work undertaken by this project, reflect on the outcomes, challenges and experience of a collaborative approach towards service delivery, and get recommendations to help establish similar partnerships with community services in your local area. Alan Humphries (Welfare Adviser, Coventry University Students' Union) and Lynne Condell (Manager, Student Money Advice Team, Liverpool John Moores University) explore the benefits to both students and universities that a highly trained team of money advisers can provide. Learn about the links between money management and wellbeing, and how better money management can improve students' university experience. Discuss how students who feel more in control of their money can have better physical and mental health, and how a holistic approach to students' money can aid retention, improve academic performance and enhance an institution's reputation. How do you support students when your institution is closed? University College Dublin closes for two weeks over Christmas, and a significant number of international students remain on campus with no access to support services, at risk of feeling alone and isolated. In this session Colum Cronin (International Student Adviser) discusses the collaborative Dublin in December project, which aims to alleviate homesickness and isolation by providing opportunities for students to create solid connections, generate community and organise activities. Emily Rozier (Head of Funding, Graduation & Awards), Jessica Bates (Funding, Graduation & Awards Officer) and Joanne Bryan (Assistant Director of Student Services) provide insights into how they worked with academic colleagues to develop transferrable-skills workshops for students about the financial issues that they are likely to encounter on entering the workplace. Learn about the research-informed process undertaken to identify the need for this training, and identify initiatives and opportunities for collaboration in your own institution. Universities exist in a data rich environment where research and insight are everyday currency. When offering services it is tempting to think that because we have as much analytics data as NASA, we are therefore having an impact. By contrast, offering customer service does not sound quite as exciting. Student Services at Coventry University have complemented their data by reaching out directly to students, committing to the principles that underlie great customer experience. Richard Stephenson (Head of Customer Services), Gabriela Rotaru (Project Manager for the Student Engagement Centre Project) and Thomas-Dylan Beale (Customer Service Manager) explore how simple technology supports complex human interactions, how to apply 'real' intelligence before using artificial intelligence, and the results of this approach. 2C – Establishing the evidence for inclusive curricula: is supplementary lecture capture an effective means of supporting students? Universities have begun to acknowledge lecture capture’s contribution to an inclusive, anticipatory approach to curriculum development, and there is growing evidence of student demand for this facility. But how do we know that this approach is effective? Vikki Anderson (Learning Support Advisor) and Sue Onens (Head of Learning Support) present research into the barriers to learning in undergraduate programmes, and the effectiveness of lecture capture in supporting students’ learning. Explore the findings and implications of this research for different student groups, and discuss the conclusions and recommendations. Esther Meininger (Head of Wellbeing Support, University of Warwick), Tony Mercer (Health and Wellbeing Programme Manager - Substance Use Disorders, Public health England West Midlands Centre), and Jemma Ansell (Welfare and Campaigns Sabbatical Officer, Warwick Students' Union) discuss a collaborative approach to dealing with student drug-use. Learn how this collaboration is leading to a greater emphasis on students' wellbeing when responding to incidents of drug-use, whilst not neglecting legal responsibilities as an institution, and the need for disciplinary action sometimes. Consider tackling the many facets of drug-use, the use of drug-testing kits, and effective messaging. Louise Knowles (Head of Counselling and Psychological Well Being Service, The University of Sheffield), Ruth Unsworth (Deputy Director Student Services, University of St Andrews), and Sophie Hodge (Senior Programme Manager, Royal College of Psychiatrists) explore how to offer, deliver and maintain a quality wellbeing, counselling and mental health service in higher education. Learn how two services have gained the APPTS (Accreditation Programme for Psychological Therapies Services) quality mark, the reasons for doing so, the improvements both services have made, and the impact on staff, students and the wider institutions. Discover a tested method of evidencing good practice and innovation, as well as establishing and maintaining a healthy and supportive community. Building on a research-informed framework for a high-quality student experience, this workshop helps you to identify key opportunities for supporting transformative learning across student journeys. Ian Pickup (Chief Operating Officer) foregrounds moments that impact significantly on students’ abilities to succeed, to foster a sense of belonging to learning communities, and fulfil goals in academic, personal and professional domains. Discuss the thresholds seen and experienced at various points of the student journey, and share practice that facilitates transformative learning through such experiences. Help co-create new pedagogical ideas for maximum impact on learning, foregrounding the use of interdisciplinary, experiential and student-led approaches. This workshop, led by Michelle Reid (Study Adviser) and Paddy Woodman (Director of Student Services), explores the lessons learned through creating Study Smart, an online transitions course for new undergraduates, designed to inform academic transition, build community, and raise awareness of available support. Discuss your own transition initiatives (or initiatives you're thinking of starting), explore how to evaluate the longer-term impact of these activities beyond initial welcome, and consider how to ensure that all students groups feel these transition activities are 'for them'. Student voice is high on the higher education agenda, and ensuring that institutions listen and respond to feedback from their students is crucial to improving student-facing services. Sandro Gunther (Campus Engagement Manager) discusses how Royal Holloway facilitates a large focus group from their diverse student body to ensure that students are consulted on the implementation of strategic change projects across the breadth of the student experience. This workshop introduces you to the project, how students are recruited and trained for it, and the ways in which focus groups are run. Experience first-hand some of ways in which you can facilitate large focus groups with students at your own institution. Like many universities, the University of Worcester has experienced challenges with inappropriate attitudes and behaviours within some sports teams, driving a need to establish a positive, appropriate and sustainable culture. Caryn Thorogood (Head of Student Services, University of Worcester) and Sophie Williams (Chief Executive, Worcester Students' Union) outline of some of the issues faced, and how the Students' Union and university worked in partnership to bring about meaningful and lasting cultural change. Participate in group discussions, using scenarios and your own examples, to explore how Students' Unions and universities can work together most productively, and to consider potential barriers and opportunities. Samantha Noble (Head of Student Experience & Communications), Sally-Anne Betteridge and Karen Blanch (Student Experience Projects Officers), and Josh Downey (student) discuss how they have developed their university's welcome and induction experience, and its continuing focus on enhancement. Get an overview of how welcome activity and branding have developed, both out of necessity (due to building enhancements) and through iterative collaboration and improvements over the years. Discover an approach to identifying and supporting specific groups of students, including collating and respond to feedback. Explore a range of challenges, focusing on how these might be mitigated, and discuss how to effectively measure impact at a high level. The use of enterprise-level analytics systems in higher education is a lively trend in the United States and is proliferating in the UK. Although the prospects seem promising, the reality is that, while big data is necessary in the 21st century to support institutional decision making, analytics systems are not sufficient in and of themselves for driving institutional effectiveness. In this era of trendy analytics software, many institutions adopt big data systems with great hopes for organisational optimisation, but not every institution sees dramatic results. Mitchell Colver (Senior Data Analyst) highlights how the difference between success and failure is not in how flashy the analytics systems are, but in the ability of any institution to take analytics into action - helping students succeed through human intervention, not just data. A postgraduate research (PGR) degree involves a continuous journey of transition and transformation as students move from apprentice to independent researcher. While this journey can be positive and exciting, it can also be emotionally and intellectually challenging. Andrea Patel (Head of the University Graduate School), Eren Bilgen (PGR Community Engagement Officer) and Katie Hoare (PGR Entrepreneurial Development Officer) share best practice for supporting their PGR community by adopting an approach that recognises diversity. Learn how mapping the PGR journey enables individualised provision, resources and facilities, which result in positive outcomes including developing essential support networks, positive mental health and wellbeing, and empowering PGRs to define and accomplish their employability goals post-degree. Details of our second keynote session coming soon! Sue Tarhan (Associate Director- Student Support Services) and Pewist Osman (Head of Student Support) discuss their university's approach to tackling hate crime, in line with the priorities of the Office for Students around student safeguarding and welfare. Learn about working with students, staff and the broader community to support students effectively, both around raising awareness of reporting hate crime incidents, and accessing support. Participate in knowledge exchange, share sector good practice in the area of tackling hate crime, and explore a range of approaches that you can use to empower your communities to report hate-related incidents and access support services. Rebecca Hughes (Student Wellbeing Project Officer) and Kirsty Convery-Hill (Active Wellbeing Coordinator) outline several University of Chester initiatives to address the growing demand for mental health support from students, utilising in-house resources. Learn about their successful Active Wellbeing Programme and new support section on the University of Chester app, how they're engaging with academic and professional services staff from across the institution to ensure early intervention and effective referral, and how they've developed a range of initiatives to ensure that the full spectrum of mental health needs can be adequately met. Identify ways in which you can utilise in-house resources at your own institution to engage and empower the diverse student body. Steve Usher (Student Support and Guidance Team Manager) and Jo Tomlinson (Counselling and Wellbeing Team Manager) provide an overview of the work and achievements of their university's Student Support and Guidance Tutors (SSGTs), who are part of the central Wellbeing Team but are based in each academic school. SSGTs aim to increase retention and engagement by providing one-to-one support, information, advice and guidance to students with non-academic issues affecting their ability to achieve their goals. Working in partnership with peers in specialist central services teams, as well as personal academic tutors and course leaders within schools, SSGTs enable and empower students to access the support and help they need. Increased focus on value for money, encompassing access, academic quality and progress into employment, drives us to analyse both general and specialist interactions in a meaningful way. The challenge is how to create a robust system to measure the effectiveness and impact of interventions and compare progression and achievement against students who choose not to engage in support. Sara Baldwin (Head of Student Support Services) and Rita Kaushal (Data Services Manager) discuss a new system to differentiate student interactions and analyse progression and retention of student groups. Explore how to differentiate between different levels of services, build a system to capture this, enable in-depth analysis, and plan better in terms the most impactful interventions. Details of our final keynote session coming soon! Julie Spencer (Head of Student Wellbeing) and Jacqueline Mayer (Director of Student Services) discuss how they have worked hard to establish their university within the local community, and build strong partnerships with colleagues in the NHS, police, County Council and other specialist services. Learn about the development of strong referral mechanisms, which now directly link to colleagues within the Crisis Team, Early Intervention Team, Sexual Assault Referral Centre, and many more. Discover how this collaboration enables the university contribute to where and how mental health commissioning money is spent across the county. Aleata Alstad-Calkins (Director of Student Support) and Emily Cookson-Williams (Student Wellbeing Officer) discuss how their Wellbeing Team developed a team of students working at Students’ Union events as Bystander Intervention Leads to tackle sexual violence. Explore how the project was developed and implemented, looking at key factors including identifying the purpose of the role, working with the Students’ Union to explore the logistics of implementing such a team, and navigating the initial implications of the project on university procedures, student life and culture. Consider the learning opportunities that developing this project created, such as how students hold each other accountable for their behaviour, the boundaries of safe peer-to-peer intervention, and the journey from bystander intervention to university disciplinary. Jenny Foster (Customer Support Manager) and Pip Dunning (Head of Advice, Guidance and Customer Service) discuss the creation of a single multi-disciplinary team to handle frontline enquiries in a new building, acting as the first point of contact for students, staff and visitors. Learn about the co-location of three existing service areas (Learning Services, Student Services and Careers), the collaboration and changes required to enable new ways of working, a review of the processes and systems (including existing and future needs), and post-occupancy evaluation of the space, services and systems. The benefits of rich user data from our student populations can have a broad impact on the services we provide, but also on our ability to proactively support students and staff. Claire Drummond (Head of Student Experience & Wellbeing) outlines a move from a reactive, crisis intervention service, to providing proactive support for students and academic staff, by analysing user data from a bespoke CRM system and using it to influence service delivery and service performance, and to provide tailored interventions. Explore case study examples that demonstrate the range of data-driven actions and interventions undertaken to positively impact the student experience, including risk management, increasing male engagement, targeted money management workshops, performance reporting and service development. Many of the students who take a substantial amount of support services' time have a diagnosed personality disorder, or display many of the associated characteristics. These students are more likely to present when in distress or crisis, are more likely to self-harm or present as suicidal, and have limited access to treatment. Academic departments often struggle to support these students, resulting in inconsistent and disempowering responses, and questions about fitness to study. Kelly Robinson (Head of Counselling and Mental Health Service) and Emma McGough (Deputy Head of Counselling and Mental Health Service) lead a discussion of case studies, good practice, strategies and tips for addressing the challenges these students face and present. Izzy Alexandrova-Isgate (Study Development Team Leader) explores the development of a series of targeted learning pathways to enhance student learning and improve equality of access for the widening participation community. These involve a range of active learning activities, peer workshops, and self-help resources to empower student learning and promote critical independence. Using an Autism Success Pathway as a case study, this interactive workshop shares best practice and identifies learning enhancement opportunities alongside areas of collaborative practice, to empower students through the design and delivery of effective student success programmes. Denise Meyer (Head of Wellbeing) introduces Gilbert's Compassionate Mind model as a coherent framework for understanding the psychological importance of community, and explaining how a sense of belonging contributes to individual student resilience. Learn how these ideas are being applied as part of innovative Office for Students-funded peer support and curriculum initiatives, in particular an initiative that the Department for Education has cited as an example of good practice in supporting student transitions. Consider the relevance of the model to supporting student transition, evaluate provision at your own institution, and debate the wider implications of focusing on collective resilience. Anne Mumford (Director of Change Projects) and Manuel Alonso (Director of Student Services) describe a university-wide initiative to create a standard, agreed and approved set of adjustments to support students with disabilities and long-term health conditions. Learn about the information sharing, including examples of implementing the adjustments through new ways of working, particularly for exams and accommodation allocation. Explore how this project was piloted and implemented, and how reviews suggest that this is really making a difference to students and staff.